PHUKET: Three men, including an ex-employee of Triple T Broadband Public Company Limited (3BB), were arrested yesterday afternoon for stealing more than 60 batteries from the company’s signal booster boxes in Thalang. Tibet Manubut, 23; Worawut Chusrinun, 20; and Narit Buakhong, 27; were arrested at their rental room in Thalang at about 3pm. They were also found in possession of krathom juice and drug paraphernalia. “We interrogated them, after which they took us to two recycling shops in Thalang where we found 35 of the stolen batteries,” said Thalang Police Superintendent Sompong Thip-apakul. The arrests were made after 3BB filed a police report about the stolen items. “We checked CCTV footage at all the spots where the batteries were stolen and were able to identify the suspects,” said Col Sompong. “They confessed and added that the spree lasted from April 19-24. At first they told us they had stolen 38 batteries, but we did not believe them as 3BB had filed complaints for a much larger number,” he added. Upon further questioning, one of the suspects confessed that he had been employed to install signal boxes for 3BB about a year ago. Before leaving the company, he stole a pair of keys so that he and his friends could go back later and remove the batteries. 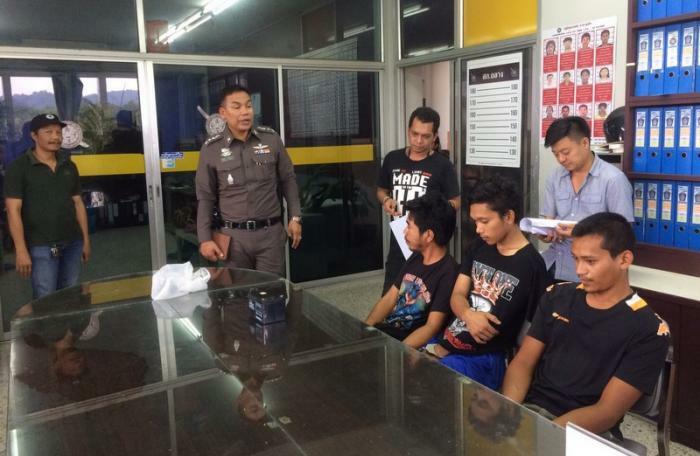 The men sold the stolen items to recycling shops for 17 baht per kilogram and said they used the money to buy the illicit substance krathom. “They also confessed to snatching the belongings of two women, one of whom was injured and had to be taken to hospital,” said Col Sompong. Checking their prior records, police found that they had earlier been involved in snatching a motorbike as well. All three were charged with robbery, theft and possession of category 5 drugs. “In total, we lost 62 batteries worth about 40,000 baht. However, this does not include the cost of problems faced by our customers, resolving which cost approximately 100,000 baht,” said Watsan Tantipongwiwat, network manager of 3BB Thalang.